I’ll start by saying I got into film noir over a year ago thanks to Sin City, and have been checking out older 40’s movies ever since. I’d seen Casablanca before that, and loved it and Bogart’s performance. Recently, I got around to seeing The Maltese Falcon, which is pure noir, and really enjoyed that and catching all the ways this year’s best movie, Brick, nodded to it. Now, 1944’s To Have & Have Not is not film noir, but it is a fantastic movie. I have to say, I love this movie, and I watched it twice in a week and it has landed a spot on my favorites list for sure. There are obvious comparisons to Casablanca, and the story does have a similar direction (Nazi’s, Martinique, Bogart’s ex-patriot helping the French Resistence, all centred around a night club). However, while the plot is serviceable and interesting, you don’t watch the movie for that. 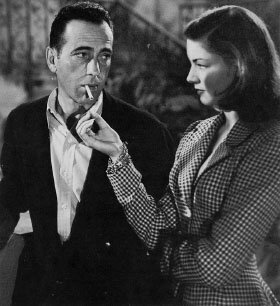 You watch it for Bogie and Bacall. This was their first movie together, and their real life romance started while filming. You can see the attraction and chemistry on screen, and the two play off each so well. Lauren Bacall, as Marie ‘Slim’ Browning, practically sets the screen on fire as she smolders her way through the movie with crackling dialogue and perceptive looks. 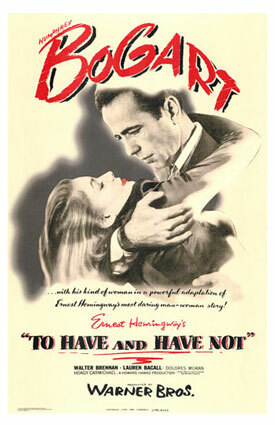 Humphrey Bogart, as Harry ‘Steve’ Morgan, is an effortless cool, with charisma to burn. The situations keep getting tighter around him, yet he just keeps one step ahead of everybody – the Gestapo, the Free French, money issues – while cracking one liners and dialogue that put most of today’s screen writers to shame. I was laughing out loud at some of his witty comments, delivered in a deadpan manner or a slight smirk intended to put people off their guard, which happens again and again. One classic quote after another. There were some special features on the DVD I watched, including a background on the filming. It was interesting to find out how the movie came about (Howard Hawks claimed he could make a movie out of Ernest Hemingway’s worst work, and he did), and the background of the beginning of the legendary Bogie and Bacall. One interesting note was that in Bacall’s first scene, she was so nervous that the only way she could stop shaking was to keep her head down, chin low, eyes gazing up. And hence, her famous look was born. Comments on "Me Mini Movie Reviews: To Have & Have Not"
Well, post 1975 means close to 30 some odd years (I hate math :) of movies to choose from, so that's not all bad. Yes, they really don't make movies like they used to. And, you've picked out some great old movies. If you like those, add these to your "to see" list (if you haven't already) in the near future...Laura, Citizen Kane, or even some Alfred Hitchcock (Rear Window, Suspicion, and North by Northwest are a few of my personal favs.) Really the list could go on and on...there are so many greats out there. Thanks for the recommendations, Blythe. I’ve seen Laura (classic noir) and North by Northwest. Loved North, as you can read here. Funny you’d mention Rear Window, as I just rented that and Bogart’s High Sierra from Blockbuster this week, but haven’t watched them yet. They have a poor classics selection, but compared to the disappointing new releases, it’s a gold mine.